Bach drew his monumental Mass in B minor together at the very end of his life, taking inspiration from other works he had written up to 35 years before. There was no obvious liturgical function for this 'great Catholic mass', as his son called it, and it is tempting to imagine that Bach wanted to bring together everything that he had learned and invented in the field of vocal music into one great memorial. It is composed in the most grandiose manner, with the chorus beginning the work in five and ending in eight parts, many extended examples of canons and fugues, and solo movements and duets in a great variety of styles, right up to the most modern. The instrumentation is also luxurious, calling for example for 3 trumpets and timpani, flutes, oboes, 2 bassoons, and a virtuoso part for the hunting horn. Today the Mass in B minor is rarely performed in its intended original context, but rather in one of our modern 'churches', the concert hall. It speaks for the power of Bach's music that, although we may have no emotional connection to the text of the Mass whatsoever, the spiritual and musical message of Bach's composition is as strong today as it was 250 years ago. This is a piece that makes us marvel at the potential of the human mind and soul, and listening to it is an affirmation of the joy and beauty of life. We are very grateful for the support of the RHL Foundation for our UK Mass in B minor performances in 2017. Bach's Passions stand apart even from his other German church music, mainly because of the role of the Evangelist. Here we have a storyteller taking us through every step of the action leading to Jesus' crucifixion, reciting the words of the Gospel (not exclusively, interestingly, that of St John). The St Passion, in contrast to the St Matthew Passion, is no 'Passion of the Christ' - John's wasn't interested in the physical suffering and pain of Jesus, but in the fact that he was the true incarnation of the loving God on earth, and that those who recognise that will be redeemed. Jesus knows what's going to happen from the start, and it doesn't bother him - it's all part of the plan. 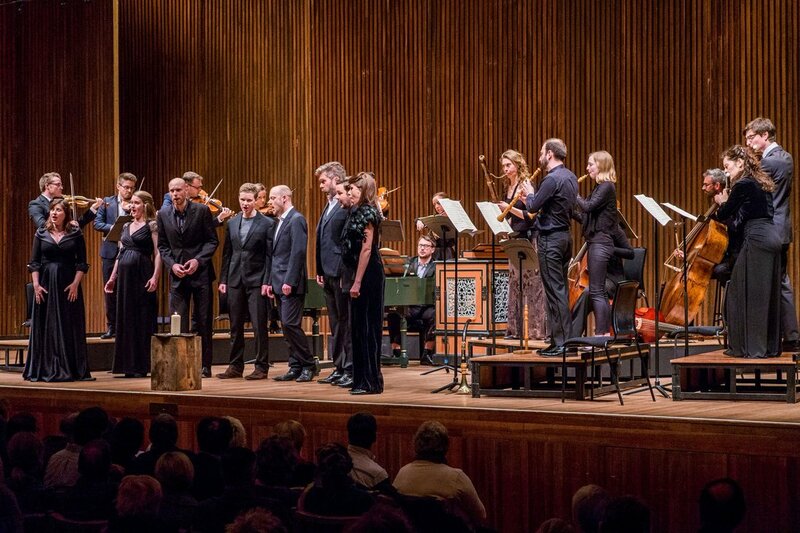 In order to tell this story as vividly as possible, the eight singers of Solomon's Knot share all of the vocal material, even distributing the evangelist part between the two tenors, and sing from memory. Performing vocal music is part of an ongoing ritual and tradition of storytelling, of passing messages between us. The Passion story has been re-told for over 2,000 years, and is a trope that has helped countless people find meaning in their lives. Through Bach's music, the events it describes become as vivid as if they had happened yesterday, and the emotions they inspire can touch all of us most profoundly, whatever our beliefs. Extrapolating the chamber concept into our first attempt at the intimidating music of Johann Sebastian Bach, we present four of the cantatas from his Weihnachts-Oratorium with 2-to-a-part forces, with explosive results. There should be video evidence soon!